There are many roads that lead to Santiago and many paths to join with others in the pilgrimage of the Camino de Compostela de Santiago in Northern Spain. This famous walk is rich in history and dates back to Pre Christian periods where it was used as a Roman trade route. The first pilgrimage occurred during the 9th century and since that time it has been used for sacred purposes to fitness and endurance feats. All who walk are met in service by Spaniards who are helpful hosts of the Camino wishing the Pelligrinos or Pilgrims, Buen Camino (a good walk). One identifies themselves with the shell of the camino worn on clothing or backpack. Having walked the Camino from just beyond the Pyrenees Mountains in the forest beyond the Spanish border with France in Roncesvalles. The Camino begins with a Pilgrim’s mass and in the trek of 500 miles to the Compostela de Santiago where the bones of St. James are believed to be buried in the Cathedral of Santiago, the walk traverses the four regions of Spain moving through a variety of terrains, cities and breath giving landscapes. Pilgrims like myself can have their Camino passports stamped by various points that create a keepsake, but it is in the steps taken and what is journeyed that is of true remembrance. The stone labyrinth at the top of the page is located just beyond Atapuerca and before Burgos at the very top of a hill. The first time I walked the Camino my first discovery was of a small labyrinth embedded in the wall of a small Pilgrims hospital that measured about a foot in diameter that was a true delight to happen upon. Small garden labyrinths could be found by those who ventured off the trail a bit and many larger ones are also discoveries waiting on the Northern trail. 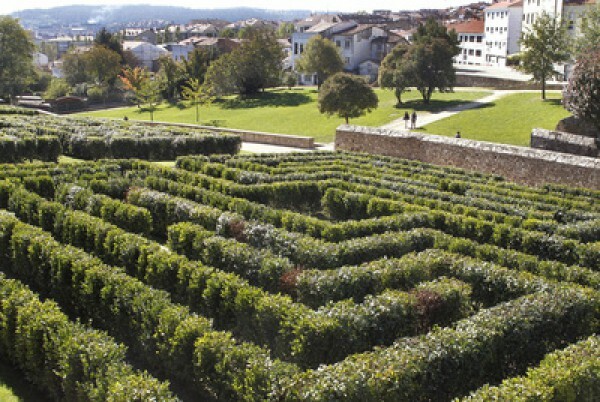 There is now an interesting trail like labyrinth in Pamplona and one also in nearby Yamaguchi Park. Carvings found in Ponte Verda and also petraglyphs found farther on in the caves of Galicia can make this a walk within a walk. It is not unusual for people to walk the Camino in different ways over different periods of time. On my second trip to Spain, a joyful discovery of a trio of labyrinths found in Belvis Park near the Cathedral of Santiago de Compastela! They are identical and measure about 4,000 square meters and delightfully are made of camellia hedges. A true walk of the senses and an experience to enjoy. Pictured below are the trio and above the singular camellia hedge design of a singular labyrinth. Explore the idea of pilgrimage today and observe the way your path steps up to meet you bringing gifts for your journey and from it.